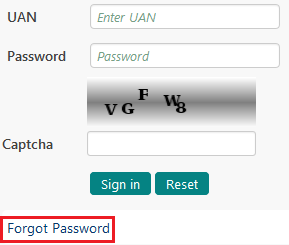 Forgot UAN Password - How To Recover or Reset Your UAN Login Password? Finance Guru Speaks: Have you forgot your UAN Password and wondering how to recover or reset it? If yes, then this article will take care of your concerns! 4. In the Next Screen, verify your UAN and Mobile No. Click on Yes to send OTP to your registered mobile no. Rules for setting the new password is mentioned in the above image. How To Download EPF (Employee Provident Fund) e-Passbook Online? EPFO: How To Activate Your UAN Based Registration? EPFO: How To Check Your UAN (Universal Account Number) Status? EPFO: How To Transfer Online Your Employee PF Account Balance? EPFO: How To Check Your Eligibilty To Claim Online Transfer Of Employee PF Account Balance? How To Register To EPFO Member Portal To Access EPF Passbook Online? 1. Try registering using the same Mobile No. 2. Use a different Mobile No. and get it registered again. Let's know if it resolves the issue. i did as u discussed above. but there is no mssg since it is shown that mssg has been successfully sent with new password. I have reset my password and havent yet received new login details on my registered mobile number. You can try to register again using your new mobile number.